While the provincial government has spent much of the past two months making decisions, changing their minds and, ultimately, admitted they made a mistake in revealing widespread changes to the Ontario Autism Program, those families affected most by the initial announcement have, effectively, been left in limbo. Local mother Jessica Di Cintio burst into tears when she heard Lisa MacLeod, Ontario’s Minister of Children, Community and Social Services Lisa, reveal, on Feb. 6, that the provincial government planned to clear the 23,000-child wait list for government-funded Applied Behaviour Analysis (ABA) treatments. She knew what that would mean for her five-year-old son Matteo, who had recently come off the wait list and was, finally, receiving the therapy he so desperately needed. Describing the changes in a way that was easy to understand, Jessica said the government was “failing” the 8,400 kids currently receiving full-time therapy in a big way. At the time of the original announcement, Matteo was enrolled in a full-time, totally funded Intensive Behavioural Intervention (IBI) program in Orangeville. The cost of that program runs in the region of $100,000 per year. 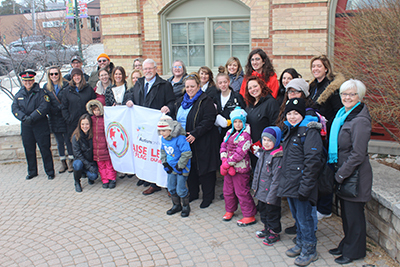 During that initial announcement, Minister MacLeod indicated that all currently-funded programs would be revisited. Instead, every child in Ontario diagnosed with autism would be designated up to $20,000 per year for kids under six, with funding dropping to a maximum of $5,000 per year until they are 18. That money could be used to help pay for whatever therapy their caregivers deemed appropriate. It appeared to be a transition towards a direct funding model, giving parents the power to select the services their child receives. “That won’t even scratch the surface of what these children need,” said Kelly McDowell, whose eight-year-old daughter Emily and five-year-old son Andy are on the spectrum. Since the announcement, Ms. McDowell has gone into fight mode. It’s something she has done before. Back in 2016, when Kathleen Wynne’s Liberal government announced it planned to implement an age cap for autism program funding, Kelly rallied and hit back. She was a provincial leader in the ‘Autism Doesn’t End at Five’ campaign, which received widespread support across Ontario. It was a popular initiative in Dufferin-Caledon, with local MPP Sylvia Jones, then a member of the Opposition, a vocal supporter. Fast forward three years and Ms. Jones, now a member of the sitting government, finds herself on the other end of the situation. In an emailed response to several questions submitted by the Citizen, Ms. Jones indicated she stood behind Minister MacLeod’s initial announcement. While the revelation that Matteo and Emily, who both attend Dufferin Child and Family Services’ (DCAFS) OASIS program at Orangeville District Secondary School during the week, would be able to continue their IBI therapy for another six months, there was little to no information surrounding what would happen beyond that. The lack of direction has, at times, made both Ms. Di Cintio and Ms. McDowell consider drastic measures. Currently, there are no plans in place for Matteo and Emily to continue ABA therapy beyond September. “I’m looking, potentially, at moving to Alberta. I’m looking at moving to other countries which the kids have citizenship to. I’m looking at doing whatever I have to do to make sure my children have access to the supports they need,” Ms. McDowell said. The OASIS program at ODSS is a pilot initiative designed to merge academic teachings with intensive therapy. In its first year, eight children are currently enrolled. The results, according to Kelly, have been tremendous, with little Emily completely transforming herself over the past few months. Without additional funding from the province, Kelly worries that Emily will end up “back at square one”. “If things go back to the way they were, I’m scared that she’s going to freeze and that will be it,” Kelly admitted. Ms. Di Cintio has had to put plans to buy a home on hold as she prepares for, potentially, having to pay for Matteo’s therapy out of her own pocket. “It makes me sick and emotional as to what I’m going to do if Matteo can’t go back to OASIS. Am I going to put him in private school to make sure someone is able to watch him at all times? So that he doesn’t run away, or get picked on, so that he’s engaged. Do I have an extra $1,000 a month for that? No. Do I have thousands of dollars to pay for the therapy he needs? No. Will I find it from somewhere? Yes, if that’s what I have to do,” Jessica said. The thought of Matteo possibly going back to elementary school “frightens” Ms. Di Cintio. She explained how her five-year-old son spent 90 percent of his time last year in what she called a “hub room”, away from other kids, in total isolation. “Basically, they take kids there when they get to be too much. They’re on their own, away from other children, away from the teacher. I often found myself asking what, exactly, he gained from that,” Jessica said. She has thought about pulling Matteo from school altogether and home-schooling him, although the social isolation that would bring “wouldn’t exactly be ideal”, she explained. Minister MacLeod, flanked by Education Minister Lisa Thompson and Health Minister Christine Elliott, made another announcement last Tuesday (April 2), stating the government would launch a consultation process with parents and caregivers in an attempt to inform those at Queen’s Park on ways it can better support autistic children who have complex needs. Minister MacLeod noted the government would be setting up a new advisory panel made up of parents with “lived experience”, while claiming every MPP would be directed to host round table debates or discussions in their communities so as to gather thoughts and opinions from local residents. Referencing the most recent announcement, made on World Autism Day, Kelly questioned what plans the government had for its Special Services at Home program, which provides an average of $3,600 per year to help children with disabilities learn new skills and gain new experiences. Ms. Di Cintio admitted she was relieved to hear the government was at least showing signs that it is willing to listen to parents on this issue, but she isn’t holding her breath that the process will change much in the grand scheme of things. “IBI and ABA are the two things that are proven to make a difference in the lives of children with autism. We shouldn’t be messing around with this. This is the future of thousands and thousands of children we’re talking about. They should be given every chance to receive the service they need,” Ms. Di Cintio concluded.